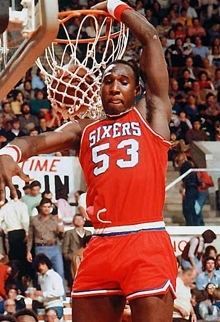 “Darryl Dawkins was once summoned in the Philadelphia 76ers‘ locker room to meet a celebrity who wanted to meet the man known for dunking with backboard-breaking force. Dawkins died Thursday at a hospital in Allentown, Pennsylvania, according to the Lehigh County coroner’s office. He was 58, and his family released a statement saying the cause of death was a heart attack. ‘Darryl touched the hearts and spirits of so many with his big smile and personality, ferocious dunks, but more than anything, his huge, loving heart,” his family said. Dawkins spent parts of 14 seasons in the NBA with Philadelphia, New Jersey, Utah and Detroit. He averaged 12.0 points and 6.1 rebounds in 726 regular-season games. His 57.2 field goal percentage is seventh best in NBA history. Darryl was one of a kind, and way before his time. He was brash and brazen, rough and rugged, and he did more for the game than we give him credit for.